Upcoming program dates: July 9-12, 2018 from 9:30am to 4:30pm + 5 weekly family sessions on Monday nights 7:00-8:15pm. This program is FREE, thanks to headspace Elsternwick. Headspace has supported GameAware holiday programs for over two years and has helped many families to get access to help. The Holiday Program is designed to encourage responsible gaming through self-regulation. 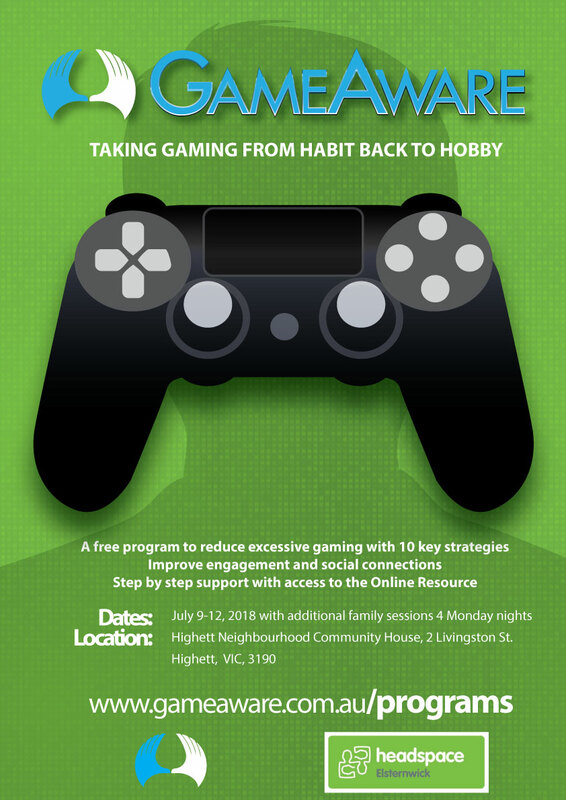 Increasing social connectedness with other hobbies and self-awareness are some of the ways the program aims to reduce harmful gaming habits. The partnership with headspace Elsternwick is a testament to the strong focus on the mental health and well-being of our gamers and their families during the program. Mornings will feature educational workshops with engaging discussions and videos. These sessions talk through relatable gaming experiences and the mechanics of addiction from a psychosocial perspective. The program will be hosted by Highett Neighbourhood Community House from 9:30am to 4:30pm Monday to Thursday. These sessions aim to engage students and show them the opportunities that arise with social connection, even if they are games based. As part of the program, families benefit from 1 initial parent information evening and 3 weekly follow up sessions at Headspace + 1 booster session 6 weeks after the program ends. These group sessions will allow for more insight as to why the young person is gaming and reframe the role of gaming to high quality, low quantity gaming experiences. Parents will play an important role in this process and will get their own membership to the GameAware Online Resource to be able to use as a reference during the program and moving forward. Parents can use this to become empowered with the knowledge and strategies necessary to help our gamers make this a sustainable change. Register online below. We have limited entries to 10 spots so get your registration in today! To get started, ask yourself: “Is the gaming out of control?” by checking out our quiz here.